Photo of Our Blessed Mother weeping in Uruguay capitol. December 26, 2014 - Reported on [Spirit Daily.com] from [here]. Rough translation from Spanish. The sculpture, located in "the garden of the Virgin" of a church which is situated in one of the longest avenues in the Uruguayan capital, have jumped in the past three weeks and "regularly", several drops some faithful and curious have been interpreted as a "supernatural phenomenon". This was said by the priest in charge of the parish, Sebastián Pinazzo. "On the image has released a liquid that will have to be analyzed from the technical point of view," he says. 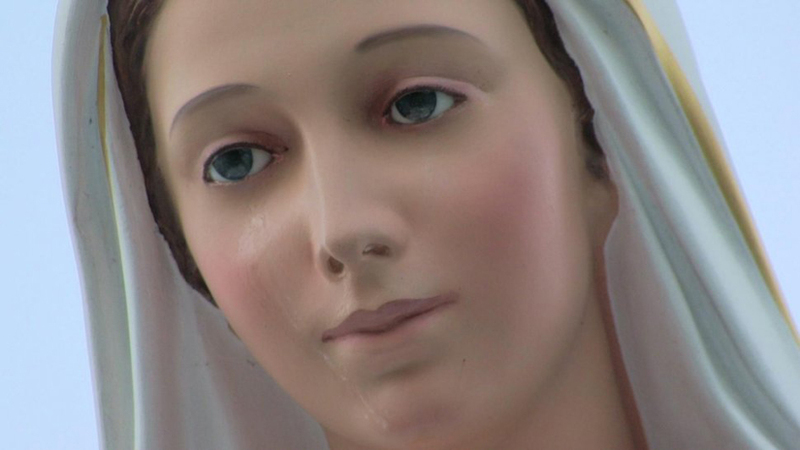 The Virgin Mary of 1,80 meters high, made with fiberglass and resin and dressed in white and blue has attracted a private pilgrimage to see with their own eyes the miraculous discovery. "I've seen cry to the mother of God from December 4 this 2014," says convinced Ana Maria, a regular parishioner of the parish for whom necessary scientific analysis are not made. "I've seen her cry and that is enough for me," he stressed.The image, a replica of the Virgin of the village of Medjugorje, in Bosnia and Herzegovina, where it is said appears from three decades ago and attributed various miracles, it was made and decorated by hand by a family artisan tradition in Rimini (Italy). Ana Maria, ensuring that it was not the only in contemplating the cry, he captured photographs with tears that emphasizes first saw out the right eye and then the two. "I came one day ordinary and I saw him and by prudence didn't say anything, but then many people", added. The fact is not unprecedented in this country, secular by Constitution and traditionally agnostic, although largely Christian among the believers, since in 2000 several faithful said having seen sprout tears from the eyes of a Virgin Mary in the Uruguayan city of Rosario. "I see that it comes out of the eye is like footprint which let the tears and comes to the Chin." It is like a trail of tears, but it is not liquid," notes on the other hand one of the curious visitors to the parish garden attracted by the news. So, Rosario Bianco, an expert in religious heritage, says that although tilda to Uruguay being a secular country, there are "many Catholics and believers" and much faith in many religions. Among the pilgrims who come to venerate the Virgin Mary, there are who ventures to comment on the reasons why the Queen of peace might have shed one or more sobs. "I believe in miracles. Many have been me. I think that crying could be due to a message from our Queen Mother of all the misfortunes that are happening in the world, that there are so many" reports Tomás, a citizen of Montevideo with Italian roots. In this regard, for another young, accompanied by a group of friends, "sure that a scientist can give various explanations", although it recognizes to be a believer and believed what Ana Maria and other parishioners say having seen. "I think that the Church has to study, but then is a matter of the faith of each one. They can be many things. I speak to you from my faith and it is crying for me", says the girl, for whom this "miracle" may have to do Christmas "or not", but only she - the Virgin - and God knows why.